Another HOT summer day. The car-park of the first supermarket on our way is a sea of baking asphalt, as usual. Near the house there’s a flock of swallows gathered on on the phone lines, in the same place as last year. Are they getting ready to leave already? Have they had enough of the heat? Arriving, welcomed by the call of the uguisu and a friendly bite from a local mosquito. Outside the house we sit for a while, immobilized in a sort of gel composed of the sticky heat and the insidious sounds of the cicadas. 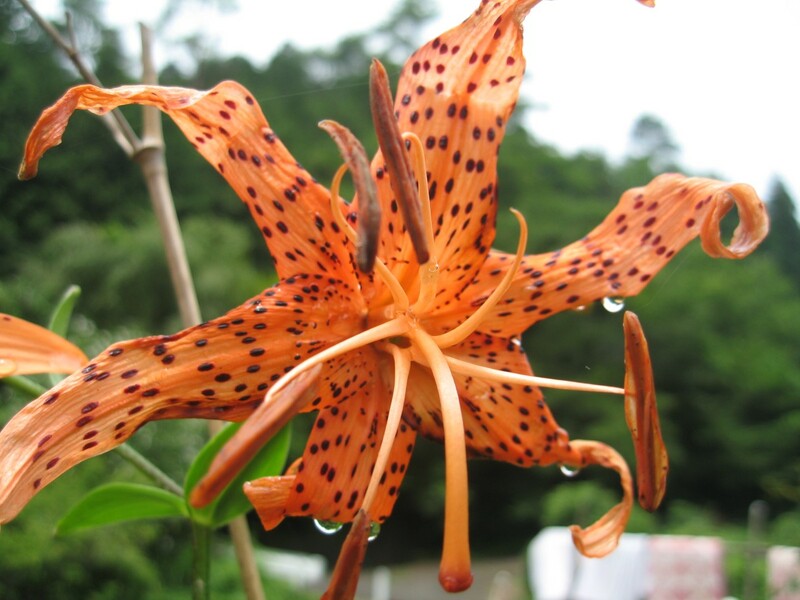 There’s a tiger-lily in bloom. A tiny baby snake, dark brown, the length of a big earthworm, but thinner, hides in the grass. It starts raining on and off in the evening and continues on Monday. Humid. Unpleasant. It’s too hot to work and everyone else is on summer holiday so we take three extra days off, driving up on Tuesday with a friend Linda in time to catch the Kanayama fireworks that evening, which turn out to be even better this year. Back to the house for dinner and a splendid insect chorus (which continues in the daytime too). Some autumn insects are starting to join in. The Perseid meteor shower peaked on Monday but we catch a few late that night. Stay up till 3:00. Wednesday is a bit blurry and too hot as usual. I’m not so genki. Taking Linda back to the station we call in at the “yottsu no taki” waterfalls, which are beautiful and nice and cool. In a good year the autumn colours round there are magnificent. Back home it’s too hot to do anything. Have an early night. Thursday morning is beautifully fresh at 9:00 but by 10:00 it’s sweltering hot. This is the daily pattern (evenings are pleasantly cool though). Myoga flowers are coming up. We see a few red dragonflies, which really belong to autumn. 15th August marks the end of WW2. It’s only three days since our last visit; we’re happy to leave the Nagoya furnace but the heat doesn’t let up out of town. In the first supermarket carpark you can feel the sun burning your face like a heatlamp. The rice is turning golden and bending over in many fields – harvest is not far away. There’s a little tree frog on the outside of our window. I find a little lizard climbing around an azalea bush. The evening stays hot, it’s that “warm humid air from the south” thing though the ground is dry – there’s been no actual rain for the last two weeks or so. Rain. The Autumn Rain Front has arrived and there’s major flooding in the west of Japan. 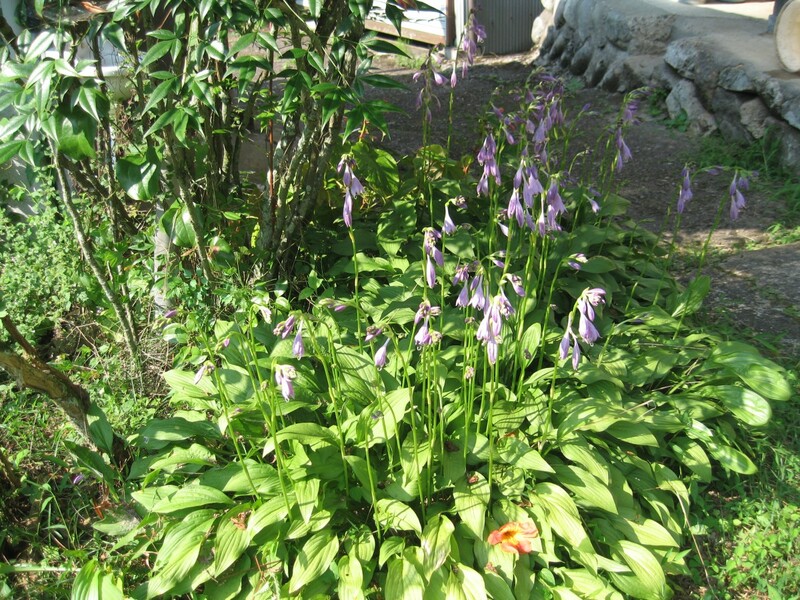 Here it’s hot, but wet too – the garden needs it though. We stop off at Kimble on the way out and hit lucky this time – real German beer at ¥95 a can! I haven’t tasted this brand but the reinheitsgebot more or less guarantees it won’t be disgusting. Maybe Germany doesn’t have the crazy variety of Belgian beer, but you can’t brew up a mixture of rice and treacle, add a bit of hop extract and call it beer. I buy three cases – no happoshu for a month or so! Goya are having a good year – is it the heat? Anyway they’re cheap and plentiful everywhere. Bitter and sour tastes are refreshing in the summer heat for some reason. Around the second supermarket it suddenly gets cool, and at the house even hints at chilly. Overhead the sky is clear blue with wispy scraps of cloud – we’ve passed through the rain front into the cool high-pressure area to the north. Autumn Rules, for now anyway, and the autumn insects are responding with a beautiful chorus. Sunday evening is cold so we go inside. That German beer is OK, somewhat dry and hoppy. It’s not amazing but for ¥95 quite acceptable. There’s a monster weed growing in front of the house. I haven’t seen this one before so let it grow to see what kind of flowers it will have. Something has been chewing on one of our pumpkins – a weasel? – a raccoon? I pick the first batch of red chillies.